Harleysville Veterinary Hospital, Skippack Animal Hospital, Bark Avenue Pet Store, and various other local pet stores and rescue organizations. ​"Thank you so much for your patience with my human. Your calm, non-judgmental guidance and gentle nature, was instrumental in the training of my human. ​We are both benefiting from all of your helpful information and experience! 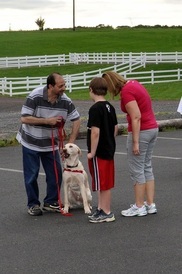 We will be practicing our new commands and look forward to attending other classes with you in the future." "We can't thank you enough for your help with Tracker! We appreciate your kind approach to training dogs. Your love for the dogs and the families emanates in your communication. I am so thankful that we are connected and your education has been essential, especially because we are new to raising a puppy. ​We were so lost without you and now we feel so much better equipped to handle our new puppy because of you. Hopefully you know what a tremendous difference you make in so many people's lives. We are so thankful for you!" My first contact with Sandy Hughes was a phone call wherein she was crying because she just adopted a dog from the SPCA and she felt it was a big mistake. I hung up the phone and immediately drove to her house. After four visits with her family, they are now in love with Bowie and he is a part of their family. She sent me this photo of her and the dog in a kayak together and she said, "This is all because of you, or he would have gone back to the SPCA." 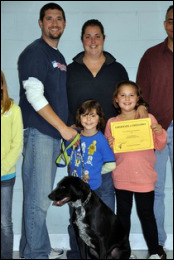 ​"We just wanted to thank you for helping us get Jilly off to a wonderful start in life. Karen, the boys, and I all enjoyed attending your classes. They were full of laughs and very helpful at the same time....an excellent combination." ​John and I were with our recent course in Dog Obedience run by Leah Pacitto at the 4H Extension Center in Creamery on Tuesday evenings. We were present for the first time, along with 4 other owners and their dogs, some who were returning for their second series with Leah. Our experience was terrific from start to finish. Leah provides a comprehensive brochure with coupons for recommended purchases, theory on dog obedience, skills and drills explanations, and much more. She is both professional and knowledgeable and encouraging and supportive as well. ​I have to say that working with you has been great. Chico, my wife and I have all learned so much in your class." "Honestly after the first class I walked away thinking 'no way is this gonna work, I just wasted my money.' But then after working with Chico a little bit each day and the second class came and he did so well my opinion was changed. Every week after that he just kept getting better n better that now I am 100% convinced that you are a very very good trainer and very professional while maintaining a personal and easy to learn system. You teach in real life terms for us all to understand. I really appreciate that. Chico is a very well behaved puppy and I owe it to you for teaching me how to get him to be that way". "Thank you so much again for having the manners and more class!!!!! I can not tell you , or anyone for that matter, how truly incredible and beneficial your class is! It was such an amazing 6 weeks, it went so fast, and was so packed full of precious information. I am such a better leader, I have confidence I never would imagine was possible. There are no words to completely thank you for offering your class and sharing your passion and wisdom. From deep down inside our hearts, we are incredibly thankful and very appreciative for all you have given. What a gift to have met you and experienced your class! " And then today, the training may have saved Enzo's life. I was re-stocking y pantry, and a 1lb bag of dark chocolate cocoa nibs spilled all over the floor. And I looked at Enzo and said "stop" and "leave it", and he sat down and didn't move until I said it was ok (after I had cleaned all of it up) So I know without a doubt that the training is helping! Thank you so much!"